The ZONTA CLUB of the PIKES PEAK AREA is on the MOVE!! We have great speakers and plans for the 2004-05 year...so join in the fun! Our June Meeting speaker, Suzanne Richardson, from the CO Women's Hall of Fame was inspiring and wonderful! We missed many of you at the meeting! New York City here they come! Club members packing and getting ready for the International Convention are our Pikes Peak Area Club Delegate, Ellen Slavitz, our alternate delegate, Renee Troppe, and members-Betty Edwards and Karen Pauley...we will be anxious to hear from them on their return.....and we know NYC will not be the same after their visit! 9 Zontians have signed up to donate time to assist the League of Women Voters encourage people to register to vote....let board members know if anyone else is interested! ICE Cream Social will be Sunday, Aug 15 in a charming house in Old CO City....tours will be given - invite your friends and prospective Zontians...invitations will be completed and available at the July meeting-THANKS to Rosalie for volunteering her home/office and for doing the invitations. Next Regular Meeting 7/19/04 at the Police Station at new starting time of 5:30 pm! See you there! How proud Pat and Chuck Kosley, Rita Jones, Renee Troppe and I were of Alicia Jones at her business' ribbon cutting on June 1. Alicia had planned a super reception with wonderful food and raffle items. You won't be surprised to learn that Pat and Rita won prizes! Many thanks to Alicia for including Zonta in her invitation list! There will be a Colorado Springs event sponsored by the Colorado Women's Agenda on Tuesday, July 13, 5:30 pm, at the Warehouse Restaurant, 25 W. Cimmaron. The event is free and the Colorado Women's Agenda will release their 2004 Colorado Legislative Scorecard and kick-off their Colorado Women Vote! efforts. I will still be visiting in the NE and will be unable to attend. I hope some of you will represent our club and show our interest in the Colorado legislature and the Colorado Women's Agenda. This event will tie into the current project of the NewZ committee, which is to work with the League of Women Voters to encourage women to register to vote. This project was presented at the last general meeting. Renee will have dates for us to consider along with sites identified by the LWV. It will be most satisfying to work with another non-profit while serving the community. Thanks to those who were able to volunteer. Renee, Ellen, Karen and I are heading to New York to attend the Zonta International Convention. Being with over 2700 Zontians from all over the world has to be experienced to be believed. The energies received from this group of women working to improve the status of women are phenomenal. Also, the energies at our last general meeting were great. We had a spirited discussion of the pending bylaw changes and I was proud of each person who presented their thoughts and ideas. This openness is what makes us strong! Good job, ladies! "Courage is the ladder on which all other virtues mount." My story begins in the central Illinois farm town of LeRoy-one of the richest soils in the nation and an ideal setting for a happy childhood in a small town. I credit my parents with giving me that most important of all life's gifts-a happy and secure childhood-which forms the basis for what we can give to others later in life. The goal of my young life back then was to marry and produce children, and I was well on the way to fulfilling it with a local boy to whom I became engaged promptly following high school. I ran amuck when I took time out to explore a little piece of the world outside LeRoy and discovered that there were lots more to life. I returned from my Spring Break adventure in Florida, broke the engagement and escaped by moving to Miami, FL where I began college. I met my first husband, Ben, in Miami. He had just returned from a stint in the Peace Corps in Nigeria and was teaching at an inner city school in Miami. Political activism was natural for him and intriguing to me and soon we were both involved in the issues of the day-race, education, war. We were married while I was still in undergraduate school at the University of Miami. I love to tell the story of how our son, Paul, was born during finals week in 1970. I was the only coed at "Sun and Fun U" waddling around in a mini-skirted maternity dress! Our travels took us to Ohio where Ben got a Master's from Antioch College, through Washington, DC for a brief internship, back to Miami for a few more years and then on to Massachusetts where both Ben and I got advanced degrees. Mine was in Educational Research (don't ask me why-it seemed like a good idea at the time). During the five years we were in Massachusetts we became involved in the efforts to deinstitutionalize youth in detention centers and mental facilities. We took into our home a succession of teenaged foster children whose issues included drugs, poverty, abuse and neglect. I joined with other local women to create a new non-profit organization, Sojourn, Inc., to serve the specific needs of young women. We developed the first independent living program for girls who had outgrown their ability to live as children in foster homes but who were still not ready to function without some supervision and assistance. I became the first Educational Coordinator for the organization, developing a Life Skills Curriculum to teach everything from birth control to balancing a checkbook. Our daughter Stephanie was born in 1977 and shortly thereafter we moved to Colorado. My brother lived in Ft. Collins and without so-much as a job interview, we packed all our belongings into a U-Haul truck and loaded ourselves and two children aboard and off we went with boundless optimism about the prospects for the future (it was the 70's after all). We settled in Colorado Springs because of a job offer. I accepted a position as the Director for what was then the Domestic Violence Prevention Center (now TESSA). From there I joined the Penrose Hospital staff as the Staff Planner, eventually working my way up over the next 15 years to the position of Vice President for Strategic Planning and Business Development. When consolidation moved my job to Denver, I chose to take the severance package and explore new opportunities. I found AIG VALIC-a financial services organization specializing in retirement plans for public and private organizations and have been happily pursuing this field for the past eight years. 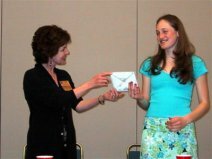 My association with Zonta began because a dear friend recruited me. I admit that I understood only that it was a service organization which was enough to bring me aboard. I've stayed with Zonta all these years because Zonta's mission and purpose (once I understood it) fits with my own beliefs. I've spent much of my life advocating for women in a variety of settings and Zonta gives me a perfect forum for continuing those efforts. It is my pleasure to be associated with all the strong, caring and dedicated women who make up the Zonta world. Join your fellow Zontians for a summer "walk-and-talk" at Waldo Canyon on Saturday, July 31st at 7am. Meet at the trailhead parking lot on Hwy 24 with comfortable shoes and a bottle of water. Optional Dutch-brunch to follow at Mountain Shadows Restaurant in Old Colorado City. Call Kris Wells if you can go so we know to wait for you! KUDOS to Betty, Karen, Renee and Ellen for attending the NYC Zonta International Convention! We look forward to hearing all about it. KUDOS to Rita Jones for setting up a food and drink schedule for next year and getting out those birthday wishes to our Zonta members. KUDOS to the new Board - Teri, Renee, Betty H., Helen, Earlene, and Kathy - you are off to a marvelous start for the new Zonta year!